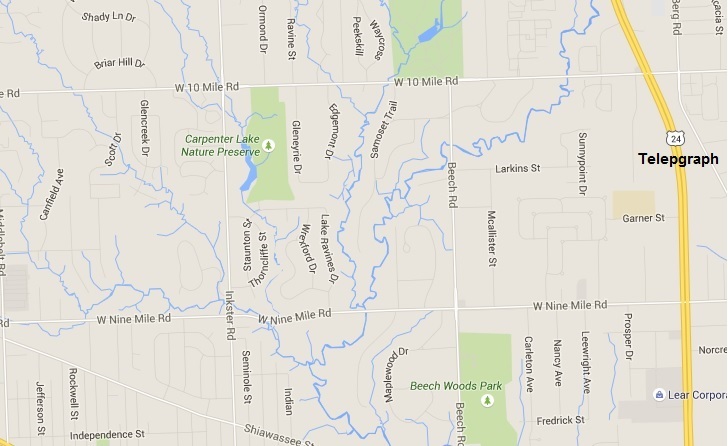 Located off 10 Mile Road just East of Inkster Road in City of Southfield, is a wonderful nature preserve. The reviews of it on Yelp.com were great and it did not disappoint. I really enjoyed my visit there. The trails have the feel of a much bigger woods. There wonderful lake to enjoy the view of and many deer that seem slightly accustomed to humans so they don't run immediately away. The preserve does allow dogs and has ample parking and sitting benches. Trash cans are present, but I didn't not see a restroom. If you enjoy photography, I'm sure you'll enjoy the preserve all year round. The park runs along side the Ravines Branch of the Rouge River. It is made up of 42 acres of nature Oak-Hickory woodlands as well as forested wetlands and native meadows. Carpenter Lake is five acres and fishing is allowed (not swimming) and more than 14,000 native game fish species were released into the lake in the fall of 2007, including various species of largemouth bass, channel catfish, bluegill, sunfish and minnows. Interpretive signs are located throughout the preserve which is home to rich variety of wildlife, including birds such as great blue herons, owls, red tail hawks, waterfowl and cormorants as well as red foxes, mink and deer. Here is a great map of the preserve trails and lake .